Front: Lifted coil springs, lower X-Flex adjustable control arms w/Flex joints, bump stop extensions and sway bar links. 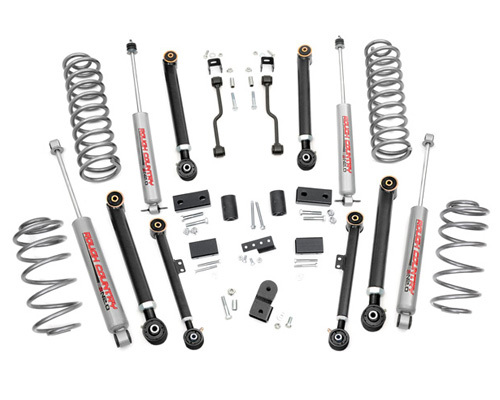 Rear: Lifted coil springs, upper and lower X-Flex adjustable control arms w/Flex joints, sway-bar brackets, bumpstop brackets, brake line brackets and track bar bracket. Shocks: (4) Premium N2.0 series shocks. • Clevite OEM style rubber bushings.